Jesus performed many miracles in His three years of public ministry. Some of them were widely publicized while others only get a brief mention. Following are some of my favorite miracles of Jesus. There were certainly many more, but these 10 give a good idea of the different types of miracles of our Lord. Some deal with the forces of nature. Some with the physical body. But all have some type of spiritual impact either on the people who experienced the miracle or for our edification today. Some of these miracles of Jesus can be found in other passages. I list those at the bottom of each miracle. But the passage that I am using as the narrative for my summary is the passage listed beside the title of the miracle. The first miracle Jesus performed in His public ministry was to turn the water into wine at the wedding of Cana of Galilee. Jesus and His disciples met Jesus’ mother Mary at the wedding. Jesus had just gathered His band of friends in the previous verses. This was to be a real introduction for the disciples of who Jesus was. Mary came to Jesus when the host ran out of wine. She knew that He was capable of helping the situation. First she approached Jesus who said He was not ready to reveal Himself to the world. But something in their exchange told Mary it was appropriate for Him to help the master of the house. Mary told the servants to do whatever Christ told them. Jesus asked them to fill six water pots full with water. Then He told them to draw wine from the pots for the ruler of the feast. The ruler was surprised that the servants had found wine. He took it to the groom who was equally surprised. John says that because of this first miracle, the disciples saw the glory of Jesus and believed in Him. But we know from some of the coming stories that they still did not have a full understanding of who Jesus was. A centurion had a servant who was sick with palsy—a type of paralysis. When someone was struck with this palsy they usually died a few days later. This centurion heard that Jesus was in Capernaum and sought the Lord to heal his servant. Jesus agreed to go to the man’s house to heal the servant. The centurion, a man of apparently great humility and faith, said that he was not worthy to have the Lord come to his house. But this man also understood authority. He believed that Jesus’ power was such that He could order the healing be done from a great distance and the person would be healed. The man departed with confidence knowing that his servant was healed. The Bible says that the healing occurred as soon as the man placed his faith in the power of the Lord. As Jesus and the disciples were crossing the Sea of Galilee a storm came up. This storm threatened to drown the little boat. But Jesus was calmly sleeping in the back of the boat while the disciples panicked. They woke the Master and asked Him if He had no care for their condition. Jesus stood and spoke to the wind and the storm and told them to be calm. The torment ceased immediately. Jesus then asked His disciples who had been with Him through so many adventures and miracles by this time why they were afraid. He asked them how their faith was still so small. Then in a very telling verse Mark points out that they were now even more afraid. They had been with Jesus and seen the miracles, but they were beginning to see that there was so much more power in this man than they had previously realized. In Jerusalem Jesus met a man who had been ill for 38 years. This man was laying beside a pool of water which was believed to have healing powers. The man was trusting in the water to heal him of his condition, but there was no one to help him into the water at the right time. Jesus asked the man if he wanted to be healed. The man replied that he did want to be healed, but that he was incapable of helping himself. Jesus told him to stand up as a healed man and take his bed and go home. Just as quickly as he was healed he found himself in trouble with the Jewish leaders. Since it was the Sabbath day their traditional laws said that it was unlawful for him to carry his bed that day. The man said that he was doing as he was told by a man with obviously more power and authority than he had to argue with. Jesus had slipped away before the Jewish leaders could find him. But later that day Jesus found the man in the Temple and gave him spiritual healing from his sins too. The stories of Jesus healing the blind are numerous. In this story Jesus heals two blind men who come to Him asking for mercy on their condition. This passage deals with several miracles of Jesus and these men had just heard about the Lord raising a girl from the dead. Jesus’ simple question to these men was if they believed He was able to heal them. In simple faith they said that they did believe. Jesus touched them and they were healed. Though there were several accounts of Jesus feeding the multitudes of people who followed Him, my favorite telling of these stories is the one found in John chapter 6. Jesus had been teaching the people all day and now it was late. They were in a remote place and had no food. The people were hungry and Jesus was concerned for them. This was not the only feeding of the multitudes Jesus did. But Jesus also saw an opportunity to teach His disciples. He asked Philip where they should buy bread. There were no markets around. They did not have enough money to feed everyone even if there was a place to buy food. But Jesus was not asking because He was concerned for the outcome. He was asking so that He could get the disciples to see the gravity of the situation and consider the miracle that was about to take place. Andrew brought a boy to the Lord who had a small lunch. 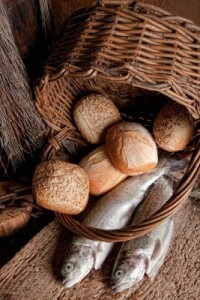 It consisted of five loaves of barley bread and two small fish. Jesus took the simple offering and prayed over it. He broke it into smaller pieces and distributed them to His disciples who doled the pieces out to the people. I think we would have been just as surprised as the disciples to find that the food we were handing out never depleted. They even gathered up the fragments of food after everyone had their fill and there was much more bread than they had started with. This passage says there were 5000 men. We also know there was at least one child and probably hundreds, if not thousands, of women and other children. This was not the only feeding of the multitudes Jesus did. That is why you will often see various numbers of people cited in the Gospels for how many people were fed. Just after Jesus performed the miracle of the feeding of the 5000 He sent the disciples in a boat to cross the sea of Galilee. They rowed 25-30 furlongs (5-6 kilometers or 3-3.5 miles) across the sea. A strong wind came upon them. Jesus came to them walking on the water, but they did not know it was Him. They were justifiably scared to see someone walking on the surface of the sea. Jesus spoke to them and they immediately knew His voice. They welcomed Him into the ship. The next day people who had seen Jesus send His disciples away alone were surprised that He was not on the shore where they expected to find Him. They also took a boat to the other side and marveled that Jesus came over the sea without a boat of His own. Jesus was with a crowd when someone brought a deaf man to Him. Jesus took the man aside from the crowd and communicated with him. Jesus indicated to the man that He understood the condition of the man by touching His ears, spitting and touching His tongue. Jesus then looked to Heaven. I think this was a visual indication of who He was and where His power came from. Jesus then said Ephphatha which is an Aramaic word which means “to open.” Jesus was opening this man’s ears and freeing his tongue. The Bible says the man spoke plain. Beyond the miracle of restoring this man’s hearing, I think it is important to point out the man spoke plainly. We are not told how the man became deaf. We don’t know how long he had been deaf. But, if it had been a long time—or even more miraculous if the man had never heard—it is a miracle that he was able to speak plainly. Especially if he had never heard the language he was now using. As Jesus was headed to Jerusalem He was met by 10 lepers. As outcasts and sick men, they knew they should not approach the general public. They called to Jesus from afar and asked for mercy. Jesus simply told them to go to the priest so that they could be proclaimed clean. As they traveled to find the priest their bodies were healed. Jesus did not need to touch them. He did not need to ask them for a show of faith. Simply through His will He was able to heal these men. Once they realized their cleansing one of the lepers returned to Jesus and bowed down to worship Him. This man wanted to thank the Lord for the healing power that was shown to him. This man was a Samaritan. Jesus asked where the other nine were. They had not returned to offer thanks. Jesus told this man that his faith had made him whole. I gather from that statement that this man not only found physical healing (as did all the other lepers) but he also found spiritual healing. He believed in the Redeemer of Israel. Mary, Martha and Lazarus were siblings living in Bethany. They were friends of Jesus. Jesus knew that Lazarus was sick and even knew that he would die. But Jesus also knew that the sickness and death of Lazarus would be to the glorification of Jesus and His power. Jesus delayed in going to Lazarus’ aid for two days. When the time was right Jesus and His disciples went to Bethany. They were met along the way by Martha. She was accusatory of the Lord. She knew that Jesus had the power to heal and save her brother, but the Lord delayed in His arrival. Jesus told her that she should not worry because He had the power to raise Lazarus from the grave. To her credit Martha believed in the resurrection of the dead because Jesus spoke of it often. She had full confidence that she would see her brother again in the future. What she did not realize is that Jesus had the power to resurrect her brother before the coming resurrection. Mary then came to meet the Lord. She too accused the Lord of tarrying which resulted in the death of her brother. Jesus wept when He saw the grief of Mary and the Jews. Others began to question His sovereignty and power. They knew He was capable of so much, but they did not believe He had the power of granting life. They did open the grave and Jesus prayed to God the Father. He proclaimed His trust and belief in the power of God. He wanted to show the people where His power originated. Jesus then called Lazarus to come from the grave. Lazarus emerged still wrapped in the grave clothes he was buried in. Many believed on Jesus but not all. The Pharisees and the chief priest began plotting to kill the Son of God. Jesus was able to heal bodies, diseases and even bring people back from the dead. The Lord had power over the physical universe. All that the Lord did in the physical realm was to help us learn who He was in the spiritual realm. Every one of these miracles had a physical result, but they can be used to teach us about a God in Heaven who wants to have a relationship with man. Through Jesus Christ, God revealed Himself to us. We can put our faith and trust in the power of the Lord for our eternal lives as well as our temporal ones. Do you have a favorite miracle of our Lord? Share it in the comments below. What an excellent article! My favorite parts of the Bible are about Jesus. Jesus really is a larger than life character who is truly the Son of God. Thank you for such a good article. My favourite miracle is one mentioned about the ten lepers. While Jesus healed numerous people, this shows us that when we, ourselves, are granted a miracle in our daily lives we shouldn’t just walk away, but take the time to how ourselves before Christ and thank him. just as the Samaritan did. THANK YOU FOR THE ACTICLES ABOUT THE HEALINGS OF JESUS CHRIST, ALL THE ACTICLES SHOULD SHOW US THAT NOTHING IS IMPOSSIBLE FOR US AS CHILDREN OF GOD, BUT I AM SO TOUCHED EVERYTIME I READ ABOUT LAZARUS COMING FROM THE GRAVE: THIS SHOWS THAT EVEN NOW GOD CAN STILL BRING SOMEONE WHO HAS BEEN DEAD FOR YEARS TO COME BACK TO LIFE. EZEKIEL 37: 1-14, TALKS ABOUT DRY BONES COMING BACK TO LIFE. ALL SO JEREMIAH 32:27 SAYS NOTING IS TOO HARD FOR GOD. The miracle of the ten lepers, I believe, is the image of the believers/saved. Only 10% go on to faithfully serve The Lord and giving Him thanks. But i would like to share His Miracles from my life…. When I was 10yrs old girl…doctor told my leaver is damaged and suggested my parents to put me in hospital under treatment ,if not my leaver might blast within 8hrs… but my Dad took me home and spent the whole night in prayer with all other members from church and of course with Maa for me and took me to the same doctor the next morning and got the report saying i m totally fine .. I see what the healings must mean to us, as you wrote about them. I cannot help but wonder that being blessed to be placed in a ministry to help the deaf why you do not use the faith that Jesus got from his Father to heal those deaf in your care. Maybe it is time! Maybe reading Science and Health with Key to the Scriptures will show you how. I too had faith but “not works”. Jesus said we too can heal. Thank you Ann. Have you healed some deaf people? Please send us their names and the time and place. For one thing, we cannot heal anyone. God alone heals…He is the one who has the power to heal. If you are placed in a deaf ministry, why don’t you heal if you are able? We are saved by faith and not works but the works the Bible teaches about is not doing miracles. Thank you so much for the wonderful works you are doing for the Lord. I’m really amazed to read for the first time that some one has devoted his time to minister to the deaf. I bless God for your life, man of God. Keep up this wonderful work of ministry God through His Son Jesus Christ our Lord has entrusted into your hands. May He grant you more grace, anointing and financial resources you need to travel worldwide, ministering to these wonderful people and providing their needs. I’m a pastor in Africa, Ghana. Thank you very much,the recorder of these Christian and spiritual works. The Jesus of yesterday, today and tomorrow (forever more) shall bless you with more Grace and anointing. He is Jehovah Jireh shall provide all you need to do more.You shall be signs and wonders to your generation and generations yet to come in Jesus Unfailing Name, Amen.